After showing all year long that her form is improving with good performances at international tournaments, the young chess talent WGM Anna Rudolf captured the Hungarian Women Chess Championship title. In the last stage of the Hungarian women finals she defeated WIM Veronika Schneider with a total result 2,5-1,5. "We are happy for the title and I hope more success will come in the future", Loszlo Rudolf, the father of Anna Rudolf, shared with Chessdom.com. "The victory makes Anna part of the Hungarian Olympic team for the Chess Olympiad in Dresden 2008," he continued. Exactly this was the Olympic dream of Anna Rudolf that she shared in an interview a few months ago. The final of the championship for Anna came after matches against strong opponents - WFM Kornelia Albert, WGM Ticia Gara, and WIM Lili Toth. 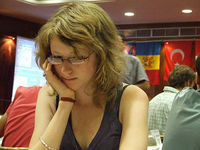 The first game against WIM Veronika Schneider was a victory with black for Anna Rudolf. However, WIM Schneider did not give up and caught up with Anna and equalized in the second game. A third game draw was forecasting a photo finish at the competition, however, Anna managed to pull out magic and win the 4th game and the match. The bronze medal was for Maria Ignácz who defeated the strongly performing Lili Toth 3,0-4,0 in the match for 3rd place.